Grammy Award winning artists and Latin pop icons Juan Luis Guerra and Juanes will perform in the first-ever Latin show at Barclays Center in Brooklyn on Saturday, Nov. 24 at 8 p.m. The show is being produced by Cardenas Marketing Network (CMN). Sean Saadeh, vice president of Programming for Barclays Center said they are proud to have the two incredibly gifted musicians,their first ever Latin artists at Barclays Center. "Nearly a fifth of Brooklyn's residents are Hispanic and we are excited for the borough to embrace such a significant show," Saadeh said. "We will continue to offer a unique blend of entertainment that reflects the diverse tastes within Brooklyn." Juan Luis Guerra and his band, 4:40, have sold over 30 million records and won numerous awards including 12 Latin Grammy Awards, two Grammy Awards, and two Latin Billboard Music Awards. He is one of the most internationally recognized Latin artists in the modern era. Guerra received Billboard's Spirit of Hope Award in 2005, was named the 2007 Latin Recording Academy's Person of the Year and was designated the UNESCO Artist for Peace in 2008, lending his support to UNESCO's action for youth violence prevention. He is nominated for 6 Latin Grammys this year. "It will be a joy to play at Barclays Center in Brooklyn and now even more so that I will be on the same stage as our beloved Juanes," Guerra said. "Music will surround us all that evening." Colombian-born Juanes became a Latin music phenomenon with the album Un Dia Normal in 2002, which was certified platinum in several countries throughout Latin America, while his third album, Mi Sangre, reached international acclaim with the hit single "La Camisa Negra" ("The Black Shirt"). In May 2012, he released "Juanes MTV Unplugged. He has won 17 Latin Grammy Awards, one Grammy Award, and received the BMI President's Award at the 2010 BMI Latin Awards. He has also received the L'Ordre des Arts et de Lettres - the highest cultural honor given in France - declaring him "Knight in the order of Arts and Letters." "Playing at Barclays Center with Juan Luis Guerra is an honor for me as a musician and as a Latino," Juanes said. 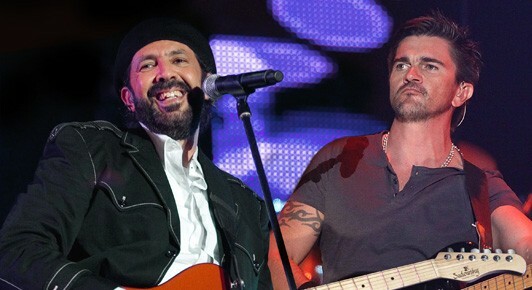 Guerra and Juanes are known worldwide for their music as well as their humanitarian efforts. Guerra was recently honored by St. Jude Children's Hospital for his dedication to helping children in need - both in his native Dominican Republic and throughout Latin America, while Juanes has long served as an advocate for victims of anti-personnel mines in Colombia and other countries through his Mi Sangre Foundation.